The Performance Tennis Pro Qualification Course is the quintessential practical qualification for the determined high performance and/or touring tennis professional. Whether you are looking to attain intuition into the mentoring of a high ranked player and/or to magnify upon your on-court coaching skills, the ATPCA Performance Tennis Pro Qualification course provides the prime opportunity for you to take your coaching credentials to the highest level. The mentoring, training & management of a professionally ranked player. A comprehensive teaching of the execution, tactics & mechanics of the return of serve. An in-depth assessment of the playing style, effects, strengths & weaknesses of an elite tennis athletes next opponent. A successful pre and post match briefing with an elite tennis athlete. The required considerations and preparation of an elite tennis athlete relating to court playing surface and environmental factors. A comprehensive teaching of the execution, tactics and mechanics of the forehand & backhand drop shot. A comprehensive teaching of strategies and tactics to an elite tennis athlete. Supervision of the required physical training and conditioning tools & techniques for an elite tennis athlete. Equipment essentials for the modern day player. A comprehensive teaching of the execution, tactics and mechanics of the forehand & backhand groundstroke lob. 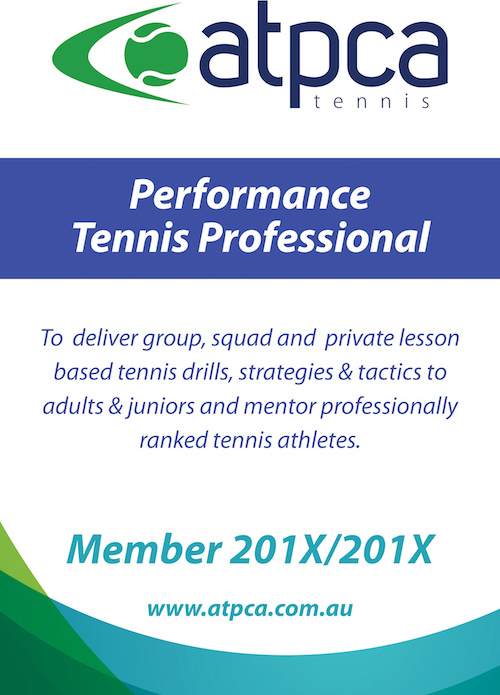 The ATPCA Performance Tennis Pro Qualification Course is held only once per calendar year and entry into the course requires applicants to have a minimum of an Master Tennis Pro Qualification (or equivalent). There is a short online quiz (which can be completed as many times as necessary) to complete at home, that aims to further consolidate the knowledge obtained during your training course. 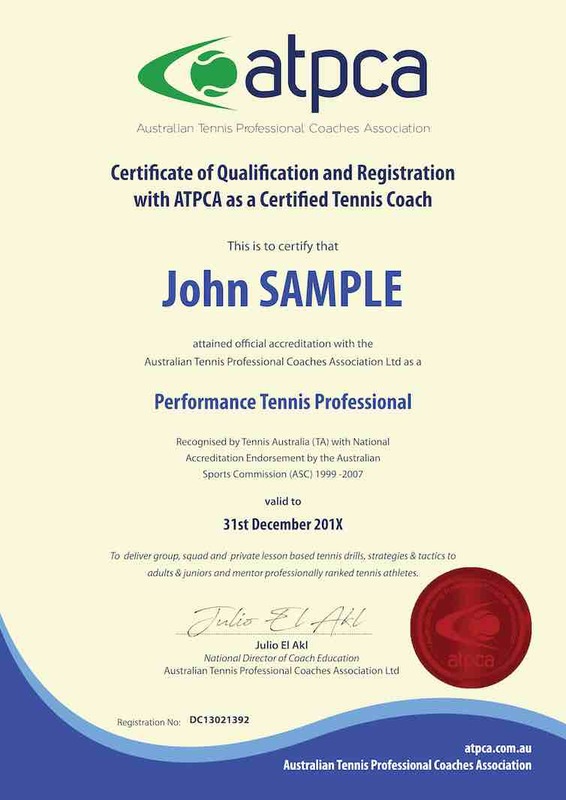 Course Graduates will receive an ATPCA National Performance Tennis Pro Accreditation Certificate, Coach License ID card & Insurance Certificate of Currency, to ensure they are properly covered to industry standards to continue or resume their coaching endeavours.